TwelveTwoTimes: It's Christmas this day? The presents arrived. After we left the kids at home alone with the babysitter for the last time on Wednesday, we dug out all the presents and populated the tree. It was stacked high thanks to all the boxes mailed from home! Then for three days we heard the same question from Kanyon. "Do you think it's Christmas this day?" Kanyon asked as he was getting him dressed. "Yes. It's Christmas this day!" Kanyon went immediately to all the presents and Corbin sat back and enjoyed all the opened toys. Surprisingly, Kanyon went for all the small gifts first saving the largest gift for last. 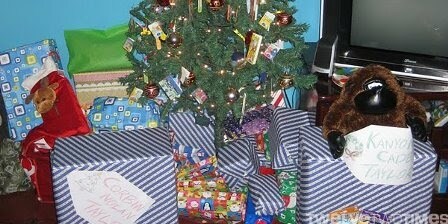 That worked pretty good because he wouldn't have wanted to to open the small gifts after he opened the large box. It was quite the adventure and definitely the most exciting Christmas ever! Check out all the photos online.